Fresh from an amusing little battle in the comments section of one of Ollie's posts, I find myself reflecting on my preference for the unusual or disregarded viewpoint. It is true that the mention of the phrase "conventional wisdom" sends me immediately in search of an alternative opinion, so yes, I am an awkward customer. But that is not the only reason for my apparent contrariness; there is also the matter of truth to be considered. Take the Turkish GP, for instance, and Heikki Kovalainen's assertion that he could have won had it not been for his slow puncture. Everyone seems to have accepted that statement without argument but I find it to be unsupported by the facts. Heikki was on a two-stop strategy and so had a heavier car than Hamilton's - and his lap times, even in clean air, reflect that. I just cannot see how he assumes that he would have kept pace with the Ferraris in those circumstances. McLaren, Bridgestone, the mathematical calculations and the rest of the world may disagree but it is quite obvious to me that the only thing that kept Hamilton in contention was the three-stop strategy forced upon him by circumstances. Of course, taking up the cudgels for the unpopular view means that often I have to own myself beaten. But hey, I have more fun doing it than I would get from running with the herd. How much enjoyment will there be in proving correct in your prediction of Raikkonen for champ this year? Let's face it, you are only one of millions in that case. But, if Heidfeld comes through at the last, my trusty crystal ball and I are going to look pretty good, aren't we? It's all about seeing what others may be missing and then sticking your neck on the chopping block. Live dangerously, that's what I say. So I notice that Scott Speed is becoming quicker and more consistent than his team mate, Liuzzi - why not give the guy a much-needed helping hand in the face of all the unfair criticism he's picking up? Incidentally, he is doing better in NASCAR already than any of the other F1 rejects. The same goes for Hamilton - the more everyone hates him, the more leeway I'll give him. It is not as if this is a new thing for me either. When Clark was winning everything in sight, my hero was John Surtees; when Jackie Stewart was the clear favorite, I was rooting for Chris Amon. Both of them were just as good as the popular heroes but were missing that necessary ingredient of luck. The great misconception in this game is that it's about being right; it is not. It's about being able to enjoy the game to the utmost, to sally forth into the battle against impossible odds, to go down fighting with the standard still raised high. Yes, it's romantic but I reckon romantics have more fun. And, once in a while, it's possible to gain a convert, to convince some hapless soul that he's not really seeing the whole picture and should broaden his sights. Such a victory makes all the defeats more than worthwhile. Perhaps that was the real measure of Michael Schumacher's greatness - he so polarized opinion on himself that the rebels united in a common loathing and forgot their personal disputes for a while. Any hero would have done the job, anyone who could beat the detested foe. It is just a pity that we had so long to wait until Alonso appeared on the scene. I see the Heidfeld supporters drifting away as Robert Kubica appears to gain the upper hand; I watch as the BMW hopefuls start buying their tickets for the McLaren and Ferrari camps; but not me. I will hold out to the bitter end, hanging on until it becomes mathematically impossible for my bets to win. And, if the moment comes when I must concede defeat, what the heck, it has happened before and it will happen again. But at least you can say that I never went with "conventional wisdom"! When it comes to drivers, I think we're all bound to have our favorites, although I do try to remain objective. Part of the fun is to argue the imponderables, however, always sifting the facts to find the reasons for what we think. I agree about Kovalainen. Any idea that he could have won the race is pure fantasy. He made a terrible start and then tangled with Kimi. Before his tyre was damaged he was heading backwards at a rate on knots. He struggled to pass slow cars on a number of occasions so there was no way he would have passed both Ferraris and Lewis on the track and he didn't have the strategy to beat them any other way. I am convinced Lewis will win in Monaco and will go on to win the championship. I may not have your certainty regarding Hamilton, Steven, but I do know one thing - he will give his all at every race, whether or not he still has a chance of the championship! 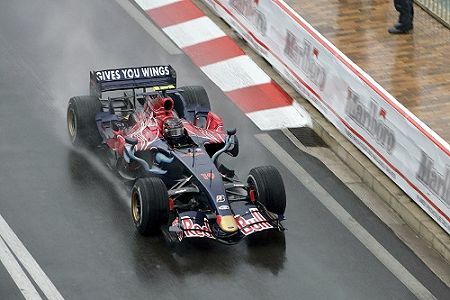 1) Had Heikki not damaged Kimi's car Lewis would have finished third at best. It had nothing to do do with his pit stop strategy. 2) You may remember I predicted at the season's beginning that BMW will not win a race this year. I'm on target so far, and come November 2 I'll still be right. Here's another prediction: Honda will win again before BMW. And it'll take Honda another 2 or 3 years to do it. Hi, Green Flag, good to hear from you! As for point (2), I salute your confidence and courage in suggesting that Honda will win before BMW does. It all remains to be seen though, doesn't it? Actually, Clive, you supported you statement with surmises. Here's my surmise - Kimi's damaged end plate cost him at least a tenth per lap. Therefore Kimi would have had around 4 seconds in hand to emerge ahead of Lewis after his (Kimi's) second stop. Even if the damage cost half a tenth a lap, a two second advantage would have put Kimi into second place. QED. I have to admit, I was a sucker while watching the race, but now I see more clearly: Why are we applauding the genius of McLaren just because they ran a three-stop strategy, as if they invented the concept of pitting out of sequence? I often find myself making a counterpoint just for the sake of seeing all sides of an issue play out, myself. Kubica did have a decent day in Turkey, just not a great one. BMW are still in the hunt, if they want to be in, and I think their big front wings may have an advantage in Monaco. After a speed-read of the other conversation, and from remembering most of his antics last year, I think Hamilton would dominate a spec-formula. He is actually very close to the edge of overdriving his car on most days, heroically drifting on his tires, and like some of Kimi's option tires, I wonder just why they last like they do. Why don't we see that sort of drive in Kubica or Webber? I think probably I am the only one applauding McLaren's genius for the three-stop strategy, Chunter - everyone else goes along with the idea that they could have won if Kovalainen hadn't picked up a puncture in his clash with Raikkonen and Hamilton hadn't been forced to try three stops. In my opinion, looking at race lap times and so on, McLaren would have been way behind the Ferraris if they had used a two-stop strategy for Hamilton. As events played out, he came second, very close to Massa, and that vindicates the three-stopper. Applauding genius may be taking it a bit far, however. There is no doubt that Hamilton had to go for three stops because of his wear rate on the front tires - it was purely serendipitous that this turned out to be the right strategy on the day. I am constantly assaulted for saying this by commenters waving quotes from the McLaren team and the results of various computer predictions; let me say again that it is all wasted argument. The conditions and circumstances on the day proved that McLaren's best bet was a three-stop strategy. Computer models are only as good as the data fed into them. Obviously, I agree that Hamilton holds the car on the extreme edge of adhesion and I have suggested that this is why his tires suffer so badly. Why Kubica or Webber fare better in this department is a mystery - Kubica's style especially is traditionally the way to kick the heck out of the tires. It may be that Hamilton's style, in stressing the sidewalls more than other drivers actually lessens the life of the tires, whereas the others are hitting the tread harder - again the more usual place to look for tire wear. To GreenFlag - if Kimi hadn't made the mistake of hitting Heikki, he would have not got past Kimi without losing far more then four seconds... Kimi's mistakes cost him big time.